LUHANSK, July 10. /ITAR-TASS/. 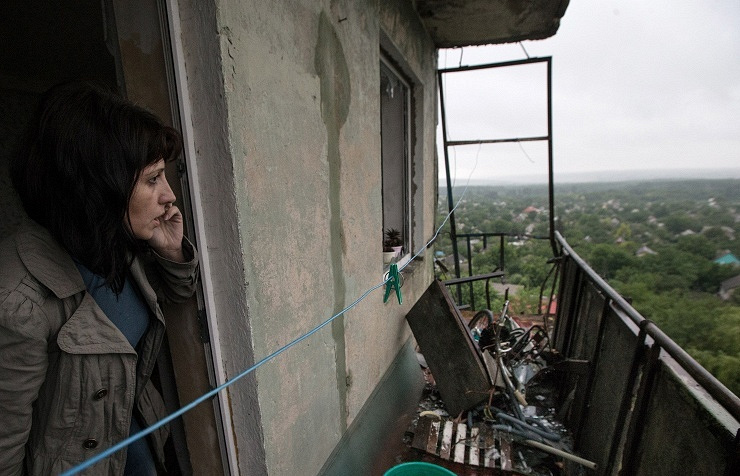 At least one woman has been killed as the Ukrainian military pounded residential quarters of embattled Luhansk with mortar fire, the press office of the self-proclaimed Luhansk People’s Republic (LPR) said on Thursday. The mortar fire was conducted by a subversive group of the Ukrainian military, presumably from the territory of the Luhansk Diesel Locomotive Plant, the press office said. “One of the mines fell near a children’s health center, killing a woman with its fragmentations. The territory of the plant was cordoned off. Luhansk self-defense militia have tried to find the subversive group, but with no success so far,” the press office said. 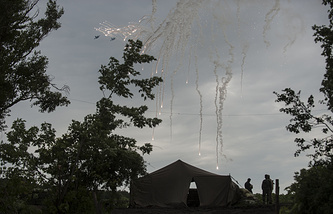 The reports, which came in the afternoon, said that the Ukrainian military shelled a militia checkpoint near the Luhansk airport with mortar fire, and then delivered a strike against the area where the regional hospital is located. After noon, the Luhansk self-defense fighters detained a car in a city district with the Ukrainian military’s artillery directing team. Ukrainian warplanes were seen several times in the skies above Luhansk. In particular, a Su-27 fighter and an An-30 plane were spotted in the area of the Luhansk airport, the press office said. The first plane was apparently conducting reconnaissance, while the second aircraft dropped ammunition and food supplies to the Ukrainian military blocked by the self-defense fighters in the Luhansk airport, the press office said. “There was trench fighting in Krasnodon and Izvarino. The Ukrainian army shelled the self-defense militia’s positions from howitzers, mortars and tanks and bombed them from the air,” the press office said. In retaliation, the Luhansk militia delivered fire on the aggressor’s specific positions from howitzers, the press office reported, adding that several shells flew into Russia’s territory from Izvarino. “Today, the Ukrainian army subjected Sverdlovsk, a district center of the Luhansk Region, to massive artillery fire. Information on casualties is currently being specified,” the press office said.